I exited my Solitron stake almost a year ago, mainly because of the poor corporate governance at the company coupled with my anticipation that nothing would happen anytime soon. Luckily it appears that things might change for the better sooner than expected. Eriksen Capital Management filed a preliminary proxy statement today in which, among other things, Tim Eriksen tries to get himself elected to the board and to declassifying the board structure. While I don’t have a position in Solitron anymore I think these changes would be great for the company, and I would urge current Solitron shareholders to support these proposals when the time comes at the annual general meeting. In the meantime, this thread at the CoBF message board should provide plenty of background on why change is absolutely needed. This entry was posted in Portfolio and tagged SODI.OB on May 21, 2015 by Alpha Vulture. Those who follow me on Twitter know that I bought a position in MCG Capital (MCGC) at the start of this month to play the merger arbitrage game. At the time, the company had announced that it had entered in a merger agreement to be acquired by Pennantpark Floating Rate Capital (PFLT) for $4.75/share. I considered this a low-risk deal since there is not a lot that can go wrong in a merger like this: it’s a deal that makes sense for both parties, there is no financing risk and there shouldn’t be regulatory risk either. So when the market offered a >7% spread I thought it was a no-brainer decision to buy a decently sized position. The market appears to be skeptical about the probability that the HC2 deal will go through based on the current price since the stock is now trading at just $4.69: even lower than the $4.75/share that is offered by PFLT while you could make 11.9% if the deal goes through at $5.25 (and it is not impossible that an even better deal can be negotiated). This is a huge return for a merger arbitrage while the downside seems well protected with the lower offer in place. On May 4, 2015, HC2 published and sent to the MCG board of directors an unsolicited non-binding offer to acquire all outstanding shares of MCG in a stock-for-stock transaction. On the same day, the MCG board of directors acknowledged receipt of the offer and committed to evaluating the proposal in compliance with the MCG board’s fiduciary duties and obligations under the Merger Agreement. Pursuant to the terms of the unsolicited non-binding offer, each share of MCG Common Stock would be exchanged for $0.226 in cash and, at the election of MCG stockholders, either (i) 0.434 of a share of HC2 common stock or (ii) 0.191 of a share of a newly created class of HC2 cumulative perpetual preferred stock with a dividend rate of 8.125%. The newly created class of HC2 preferred stock would have certain liquidation preference and cumulative rights but would also be subject to a mandatory conversion into HC2 common stock at HC2’s election in certain circumstances. HC2 valued the consideration at approximately $5.00 per share of MCG Common Stock. On May 5, 2015, the MCG board of directors met with representatives of Wachtell Lipton, Morgan Stanley and MCG management to discuss HC2’s unsolicited non-binding offer. Representatives of Wachtell Lipton informed the MCG board of directors of its fiduciary duties under applicable law as well as MCG’s obligations under the Merger Agreement. Subsequently, representatives of Morgan Stanley discussed the valuation of the proposed merger consideration and provided the board with an overview of HC2’s business and historical performance. In its analysis of the proposal, Morgan Stanley noted that there were no independent, third-party estimates or price targets available for HC2 and that HC2 has a limited operating history as an industrial holding company under its current leadership team. The MCG board of directors discussed, with the help of its legal and financial advisers, the advantages and disadvantages of HC2’s unsolicited offer. The board noted that HC2’s latest proposal offered the same type of consideration as HC2’s final proposal in the second round of the process and therefore raised similar concerns for the MCG board of directors. The MCG board of directors also discussed the lack of closing certainty of HC2’s offer. Pursuant to the proposal, the proposed transaction was subject to further due diligence and negotiation of a definitive transaction agreement. The MCG board of directors noted that HC2 had conducted diligence during the process and had the same unfettered access to MCG’s data room and members of management as every other bidder initiated into the second round and MCG’s assets consisted largely of cash and other easily valued assets. The MCG board of directors also noted the fact that HC2 did not submit a proposed merger agreement with its latest proposal even though a proposed merger agreement was provided with HC2’s final bid in the second round of the process and stated that the proposal was subject to the negotiation of definitive documentation. On May 11, 2015, a special meeting of the MCG board of directors was held with representatives of Wachtell Lipton and Morgan Stanley as well as members of MCG management. At this meeting, the MCG board of directors discussed further, with the help of its legal and financial advisors, the unsolicited non-binding offer from HC2. The MCG board of directors considered the information available regarding HC2’s business and Mr. Falcone’s recent admissions of securities laws violations as well as the valuation of the proposed stock consideration, prepared by Morgan Stanley. The MCG board of directors specifically discussed the volatility of the HC2 common stock. In its analysis, Morgan Stanley had noted that HC2 common stock had been in the 50 to 75% volatility range and its historical volume-weighted average price was $9.3058 for the six-month period before the meeting date. Unlike PFLT Common Stock, which has traded consistently between $13 to $14 for a sustained period of time, HC2 common stock had a 52-week low of $3.77 and high of $13.09. As to the preferred securities offered, the MCG board of directors noted the uncertainty surrounding a future market for the securities considering their subordination in HC2’s existing capital structure and their low rate of return compared to that of HC2’s existing indebtedness. The MCG board of directors also considered the difficulty of obtaining the necessary approval of MCG stockholders for the proposed transaction given the nature of HC2’s business. The MCG board of directors discussed the significant differences between HC2’s investment holdings and that of MCG’s legacy portfolio. The MCG board of directors discussed the fact that the proposed transaction would replace MCG stockholders’ investments in a lower risk portfolio of senior secured loans that was protected by the 1940 Act with holdings in a highly-levered portfolio of equity securities with a limited track record and in a company that offered no 1940 Act protection. The MCG directors also specifically considered Mr. Falcone’s recent admissions of securities law violations, the highly leveraged structure of HC2 and the significant compensation paid to its principals despite the company’s relatively low earnings. The MCG board of directors discussed Mr. Falcone’s history of securities law violations and the existing ban by the SEC on his “acting as or associating with any broker, dealer, investment adviser, municipal securities dealer, municipal adviser, transfer agent, or nationally recognized statistical rating organization” as well as a number of other factors that the board had previously considered in evaluating HC2’s earlier proposals. In addition, the MCG board of directors noted HC2’s substantial borrowings and its potential impact on the value of the securities to be issued to MCG stockholders. Despite the “preferred” designation of some of the securities offered as consideration, the HC2 equity securities would be subordinated to $54 million of existing HC2 preferred stock as well as $396 million of debt, valued as of May 10, 2015. Later that day, HC2 filed its Quarterly Report on Form 10-Q. On May 12, 2015, HC2 submitted a letter to the MCG board of directors requesting a response to its most recent proposal. On May 14, 2015, the MCG board of directors met with representatives from Morgan Stanley and Wachtell Lipton as well as MCG management to further evaluate HC2’s proposed transaction and to discuss the recent communications received from HC2. Morgan Stanley provided a comparison of offers received as well as further analysis of the expected timing to close each transaction, certainty around each offer, HC2’s performance, information on HC2’s lines of business, comparison of stock ownership of HC2 and PFLT and the consideration that MCG shareholders would receive in each transaction. Morgan Stanley also discussed the valuation of the consideration offered by HC2 and noted that while it was unclear whether the termination fee was payable by MCG or by HC2 if the company decided to accept HC2’s offer, but that they assumed if MCG stockholders bore this cost, and accounting for that fee, the stated value of the proposed consideration payable drops to $4.81 per share, which amounted to approximately 106% of the company’s estimated NAV at closing. In addition, Morgan Stanley discussed HC2’s investment holdings and its results of operations as reported in HC2’s Quarterly Report on Form 10-Q filed on May 11, 2015, including those of the HC2’s two largest investments—Global Marine Systems Ltd. and Schuff International Inc. Morgan Stanley noted that HC2 reported favorable projections for the company’s future earnings but there were no third-party estimates or price targets available for HC2 or its portfolio companies. The MCG board of directors noted that HC2 acquired both investments with a substantial amount of debt at valuations significantly lower than their implied value today. In addition, the MCG board of directors again expressed concerns regarding the differences between HC2’s highly-leveraged capital structure and MCG’s legacy operations. The MCG board of directors instructed Morgan Stanley and MCG management to conduct further research and analysis of HC2’s financials in light of its recent earnings release. On May 17, 2015, after further analysis of HC2’s SEC filings and other publicly available information, the MCG board of directors met with representatives of Morgan Stanley, Wachtell Lipton and MCG management to again discuss HC2’s proposal. MCG management provided its analysis of HC2’s capitalization, results of operations and free cash flow as well as a sum-of-the-parts analysis. Morgan Stanley provided its analysis of HC2’s pro forma results as outlined in its SEC filings as well as HC2’s current valuation implied by its market capitalization. The MCG board of directors discussed, with the help of its legal and financial advisers, the risks associated with the significant amount of debt and preferred equity that would rank senior to the securities offered in the proposed transaction by HC2 to MCG’s stockholders, the volatility in HC2’s stock price, the ability of HC2 to raise an equivalent amount of equity capital in the open market, and the limited amount of free cash flow available to holders of HC2 common stock relative to pro forma EBITDA. Morgan Stanley also reviewed the marketability and liquidity of the securities offered by both HC2 and PFLT. Wachtell Lipton also noted that a transaction with HC2 would mean that MCG stockholders would no longer enjoy the protections of the 1940 Act that are currently applicable to MCG as a BDC. These protections include limitations on affiliate transactions, incurrence of debt over a certain percentage of total assets, diversity of portfolio investments and issuance of stock below NAV as well as a requirement to establish a corporate code of ethics. Following discussion, the MCG board of directors determined to reaffirm its recommendation of the Merger and Merger Agreement. 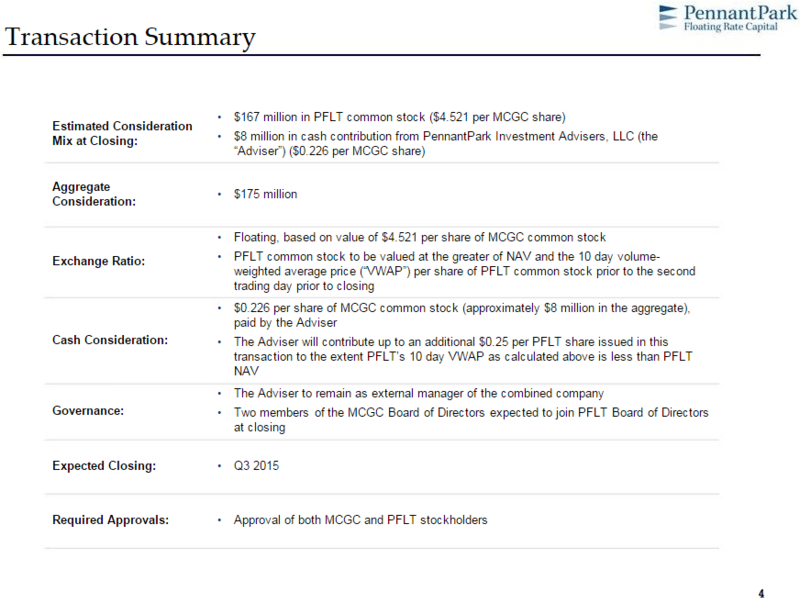 On May 18, 2015, the MCG board of directors received a letter from a stockholder holding over 5% of the outstanding MCG Common Stock that included a suggestion that a transaction with MCG provided value to both HC2 and PFLT and that the unsolicited proposal from HC2 provided an opportunity for PFLT to increase its existing offer. Subsequent to receipt of the letter, Mr. Neu inquired of the chairman of PFLT whether there were any circumstances under which PFLT would revise its existing offer to provide more value to MCG stockholders. After discussion, PFLT management indicated that there were no circumstances under which it would revise its existing offer. The MCG board of directors met later that day to review the stockholder letter. Upon discussion of the arguments presented in the letter as well as various factors previously noted by the MCG board of directors, the MCG board of directors determined to reaffirm its recommendation of the Merger and Merger Agreement. Anyway, I think the new proposal should remedy a lot of the apparent concerns of the MCGC directors. HC2 is now offering a bigger premium: that should make the deal a lot more attractive even if you assume that a break-up fee needs to be subtracted from the valuation. There is a bigger cash component, and the exchange rate is now floating which should address some concerns about HCHC’s price volatility. In addition, the option for HCHC preferred shares as a consideration was dropped because that was apparently a negative (even though it was an option). There is also no need for additional due diligence anymore, and a proposed merger agreement is now also included in the revised offer. So I think the new offer represents a substantially better deal, and I think MCGC directors will have a hard time rejecting it. And even if they do, I doubt that activist shareholders will let it slide since management only owns 5% of the company and they have already a successful history of effectuating change at the company. I think MCGC is currently a pretty sweet deal. The worst case scenario is probably that the original deal goes through at $4.75/share and you make a little bit of money, but I think it is more likely that in the end the superior HC2 offer will be accepted which would result in a fantastic return. It doesn’t get a whole lot better than this: merger arbitrage doesn’t have to be about trying to pick pennies in front of a steamroller. This entry was posted in Portfolio and tagged HCHC, MCGC, PFLT on May 19, 2015 by Alpha Vulture.